In May 2018 the Nazarbayev University School of Public Administration in Astana was once again host to the final training week of the SME Competitiveness programme in Kazakhstan. 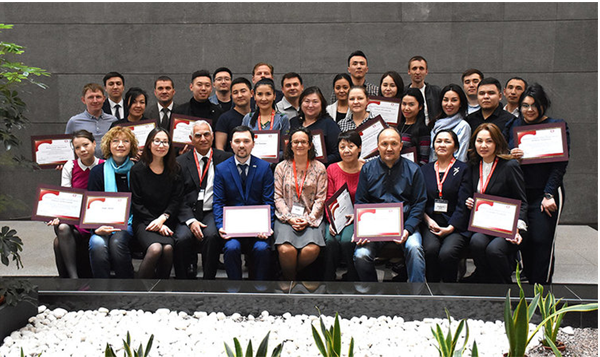 Funded by the Ministry of National Economy (MNE) of the Republic of Kazakhstan, the 12-month training aimed at capacity building in cluster management within Kazakhstan Industrial Development Institute (KIDI) and its delivery partners. The training programme was based on the management training curriculum of the European Cluster Excellence Initiative (ECEI). It was delivered jointly by the European Foundation for Cluster Excellence and the Cluster Competitiveness Group Inc.
As a conclusion to the programme, on Saturday 19th of May, 2018 the stakeholders from a number of government departments and ministries participated in an interactive briefing session on cluster-based economic development. More information on the programme is available here. For more details please contact info@clusterexcellence.org.